HESS J1809-193 - more than one PWN? Also a gamma-ray source? 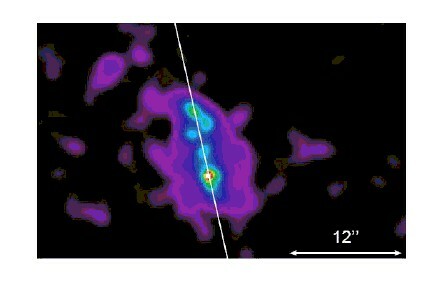 Combined Chandra X-ray and radio image of the remnant G11.2-0.3. The remnant has about 5' diameter, and may result from a historical supernova observed almost 2000 years ago by Chinese astronomers. At its very center is the pulsar PSR 1811-1925. From NASA/CXC/Eureka Scientific/M.Roberts et al. ; Radio: NRAO/AUI/NSF. The very high energy gamma ray source HESS J1809-193 was discovered in a search for emission associated with pulsars in the range of the H.E.S.S. Galactic Plane Survey (Aharonian et el. 2007). Slightly offset from the pulsar PSR J1809-1917, the source was detected with a significance of 6.8 sigma and classified as a likely pulsar wind nebula (PWN), fed by a stream of electrons from the 50000 year old pulsar, at a distance of about 10000 light years from Earth. About 1% of the pulsar's loss of rotational energy would be required to power the gamma rays, well in the range observed for other pulsar wind nebulae. Additional data taken since the discovery increased the detection significance considerably, to well above 10 sigma ( Fig. 1, from Renaud et al. 2008). Two other pulsars are in the source region: PSR J1809-1943 has a modest spin-down energy loss and can hardly contribute to forming the nebula, but the young pulsar PSR J1811-1925 is comparable in energetics to PSR J1809-1917 and possible responsible for hints of a substructure in the gamma-ray image. Chandra images of the PSR 1809-1917 field (Fig. 2, from Kargaltsev and Pavlov 2007) show a peak of X-ray emission at the location of the pulsar, and a trail of emission extending over 10" away from the pulsar, clearly indicating a pulsar wind nebula. Kargaltsev and Pavlov attribute the asymmetric pulsar wind trail to supersonic motion of the pulsar in the ambient medium, as seen for other pulsars such as "the Mouse" (Gaensler et al. 2004). At an age of about 50 kyears, electrons will have had enough time to convect away from the pulsar and to form the extended gamma-ray nebula, mostly invisible in X-rays because of the low surface brightness. The second energetic pulsar, PSR J1811-1925, is embedded in the supernova remnant G11.2-03 (top image) which is resolved both in radio and X-rays (Kaspi et al. 2001, Helfand et al. 2006). 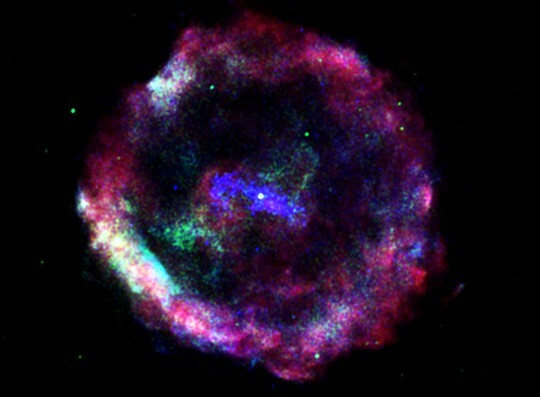 PSR J1811-1925 also exhibits a X-ray pulsar wind nebula (Roberts et al. 2003). 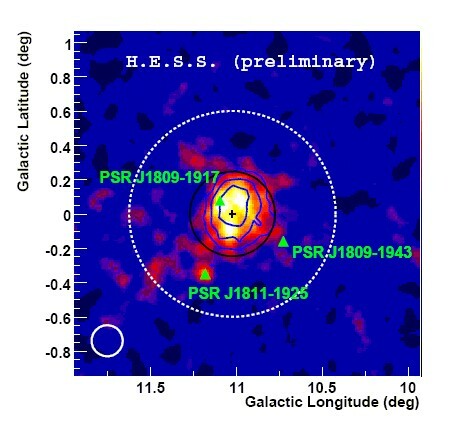 PSR J1811-1925 is furthermore a source of hard X-rays detected by INTEGRAL in the 18-60 keV range (Fig. 3, from Dean et al. 2008). Given the modest age of the remnant, electrons in the nebula will still be confined within a few arc-minutes from the pulsar, in contrast to to PSR 1809-1917. One might speculate that PSR J1811-1925 / G11.2-03 contributes locally to the gamma-ray emission shown in Fig. 1, but disentangling the contributions appears difficult on the basis of the existing H.E.S.S. data set. Fig. 1: Smoothed gamma ray map of the region of HESS J1809-193. The blue contours give the 4, 6 and 8 sigma contours of a gamma-ray excess integrated over a radius of 0.1 degr. around a given position. The rms source size as determined by fitting a Gaussian is indicated by the black circle; the dotted circle shows the region over which the spectrum has been extracted. The small white circle illustrates the point spread function of the instrument, including the smoothing applied to the image. Fig. 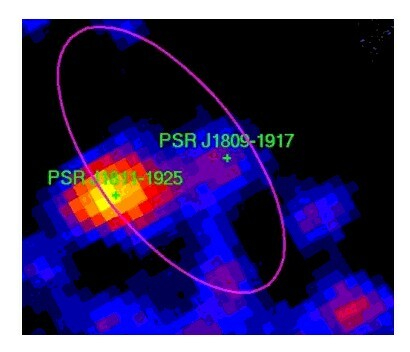 2: Adaptively smoothed Chandra X-ray image of the field of PSR J1809-1917. Scales are enlarged by about a factor 100 compared to Fig. 1; coordinates are Ra-Dec rather than the Galactic coordinates used in Fig. 1. From Kargaltsev and Pavlov (2007). Fig. 3: INTEGRAL hard X-ray image of the region of HESS J1809-193 (indicated by the ellipse) (Dean et al. 2008). Coordinates are Ra-Dec rather than the Galactic coordinates used in Fig. 1.